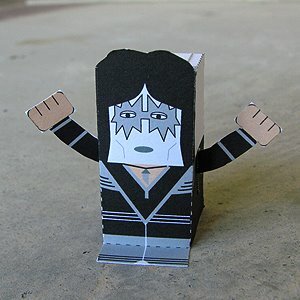 This paper toy is Ace Frehley, the papercrafts is designed by Toy a Day. Paul Daniel “Ace” Frehley is an American musician best known as the former lead guitarist of the rock band Kiss. He took on the persona of the “Spaceman” or “Space Ace” when the band adopted costumes and theatrics. Frehley played with the group from its inception in 1973 until his departure in 1982.